From "Arkansas Black Apples" to "Winesap Apples"
An apple isn't just an apple. The range of varieties at many farmers market is inspirational—some crisp, some sweet, some perfect for snacking, others better suited to making apple pie. Find wonderful varieties well beyond the classic Red Delicious below, then learn more about apples before hitting the farmers market or going to pick your own. Arkansas Black apples are tart and noticeably tannic—that's the feeling you get from red wine that makes your mouth feel like all the moisture has been sucked out of it. For people who crave a tart apple for snacking, there is no finer. They're also a perfectly decent baking apple. Cox's Pippin apples just may have the best apple name ever. They have yellow skin and yellow flesh, with a mild apple flavor. A good, solid eating and baking apple popular in the Northeast. Empire apples are brilliantly red. They have a crisp texture and spicy flavor. But perhaps best of all, they make a lovely, rosy applesauce. They are also good for eating, but will lose their shape quickly when baked. Fameuse apples are also known as snow apples, so called because of their snowy white flesh. They are a parent of the delightfully scented McIntosh apples. They're tangy and sweet and great for eating or baking. Gala apples are a great eating apple: crisp, firm, sweet. Many people find they taste a lot like the more commonly available Golden Delicious apple. One of the more commonly available varieties listed here, Golden Delicious apple have a flowery aroma and sweet flavor. They keep their shape so much when cooked that they are not recommended for applesauce. Of course, that makes them perfect for pies and tarts. Gravenstein apples are the first apples to ripen—in August—in their home on the West Coast. Gravensteins are fairly tart, crisp, and very juicy. They are good eating apples, great baking apples, and make particularly good applesauce. Hawaiian apples are crisp, firm, and very sweet. They are better for eating than for baking, and they are perfect for those who like sweet, rather than tart, apples. Ahh, Honey Crisps. Their name says it all. Sweet and crisp and juicy, these are great eating apples, which is why they're so popular and increasingly available at many markets. 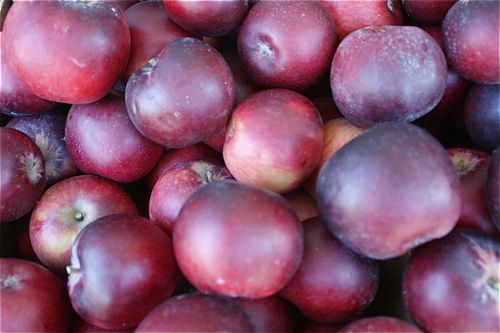 Jonathon apples have a rich, almost creamy texture and a particularly tart, spicy flavor. They are a great eating apple since they're so juicy. They also bake well both on their own as baked apples or cut up into pies or tarts. Between their green-and-red coloring and their tiny three-bite size, these dainty, tiny little apples are irresistible. If nothing else, they are utterly and completely snack-size. MacIntosh apples are pretty red-and-green apples with a good sweet-tart balance and a crisp, juicy texture, They are great eating apples but turn to mush almost immediately when cooked, which means they're fine for applesauce but poor choices for pie. Mutsu apples were first grown in Japan. They are a cross between a Golden Delicious and an Indo. They have a creamy white flesh, a crisp yet juicy texture, and a mellow apple flavor. They are great for eating and baking. 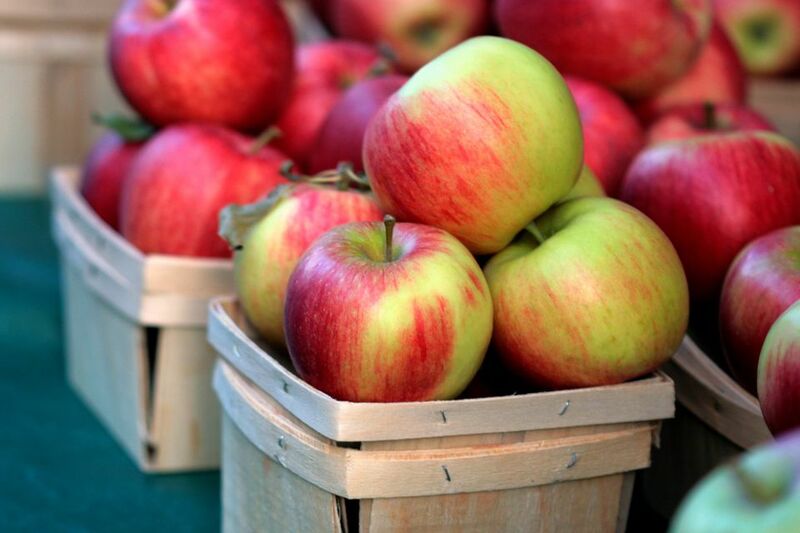 Northern Spy apples are one of the great eating apples, known for complex flavor. Sweet and tart, crisp and juicy. They also bake well. Pink Ladies are definitely pretty in pink. With light red skins on the outside, they have a delicate, sweet, pink flesh on the inside. They are great eating apples. Rome Beauty apples are crisp and firm. They are great for baking since they hold their shape well. they tend to be a bit dry and so are less commonly used as eating apples. If you like tart apples, Sierra Beauty apples are for you. They are super tangy, along with being nice and crisp. Their crisp texture makes them good for eating, and their natural tang makes them ideal for baking. Winesap apples are small. very firm, crisp apples. They have a slightly spicy flavor that's great for eating and baking. They are also an excellent storage apple if you're lucky enough to have a cellar.